Graves’ Disease research papers examine the autoimmune disease that affects the thyroid gland, resulting in hyperthyroidism and an enlarged thyroid. 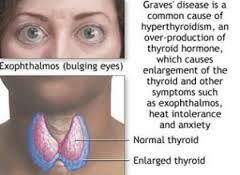 Graves’ disease is an autoimmune disease affecting the thyroid gland, resulting in hyperthyroidism and an enlarged thyroid. The writers at Paper Masters custom write any research project on medical disorders and diseases that you need written. Always availalbe and with excellent customer support, Paper Masters knows how to write medical research and document properly. The most recognizable symptom of Graves’ disease, occurring in 25 to 80 percent of cases, is bulging of the eyes, known as Graves’ ophthalmopathy. Notable cases of individuals with Graves’ disease and the resulting eye bulge include comedians Rodney Dangerfield and Marty Feldman. Other notable individuals diagnosed with Graves’ disease include President George H.W. Bush, actress Maggie Smith, rapper Missy Elliot, and singer Sia. Graves’ disease is named after Irish surgeon Robert Graves, who described the condition in 1835. However, a number of other historical descriptions exist. Graves' disesase affects 0.5% of the population. Graves disease often develops during middle age, between the ages of 40 and 60, and affects women far more than men. The exact cause of Graves’ disease remains unknown, but is believed to be the result of a combination of genetic and environmental factors. Because it appears later in life, it is suspected that a viral or bacterial infection may trigger antibodies which lead to the disease. Treatment includes anti-thyroid medications, which must be administered over the course of six months to two years in order to be effective. If left untreated, Graves’ disease can be fatal. Autoimmune Thyroiditis research papers examine a disease in which the body begins to attack the thyroid, producing antibodies that eventually destroy a person’s thyroid cells. Thyroid sDisease research papers will discuss an overview of the anatomy and physiology involving the medical condition. Endocrine Diseases research papers discuss the disorders of the endocrine system. Disease research papers look into the term used for any abnormal condition, affecting all or part of an organism. Celiac Disease Research Papers delve into this chronic digestive disorder referred to as gluten intolerance. Types of Lupus Research Papers investigate systemic lupus, and drug induced lupus. Paper Masters writes custom research papers on Graves’ Disease and examine the autoimmune disease that affects the thyroid gland, resulting in hyperthyroidism and an enlarged thyroid.